The Space Supreme is a premium retractable banner stand from a quality-focused company that has advanced features like a removable roller and adjustable height. The Supreme 33 displays a graphic with a visual area of 33.4" wide x 35" to 84.7" high. 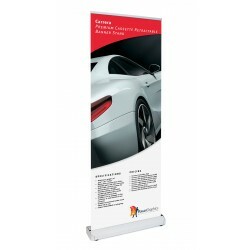 The Space Supreme is a premium retractable banner stand from a quality-focused company. The Supreme has a shape and features that have been copied by other companies, but this is the original and still the best quality version you will find. 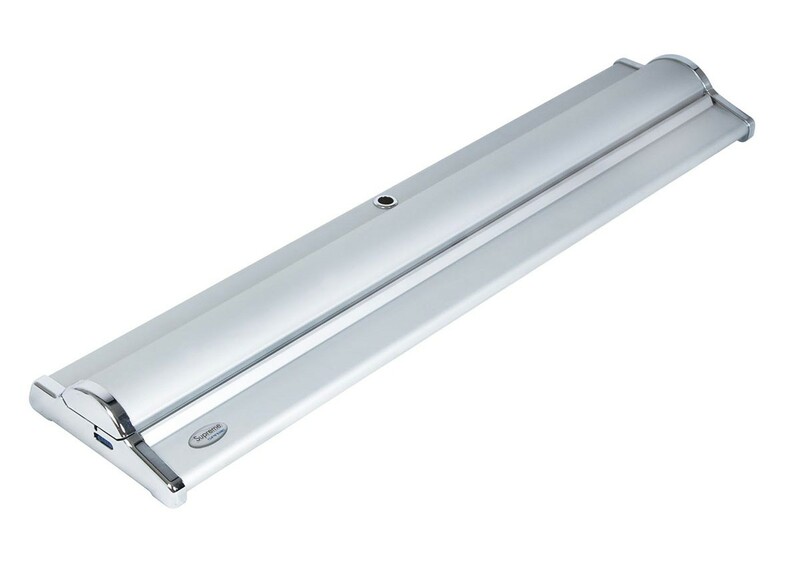 The base has a hinged top that opens via push button releases on the sides to provide access to the fourth generation roller with two mounting options. 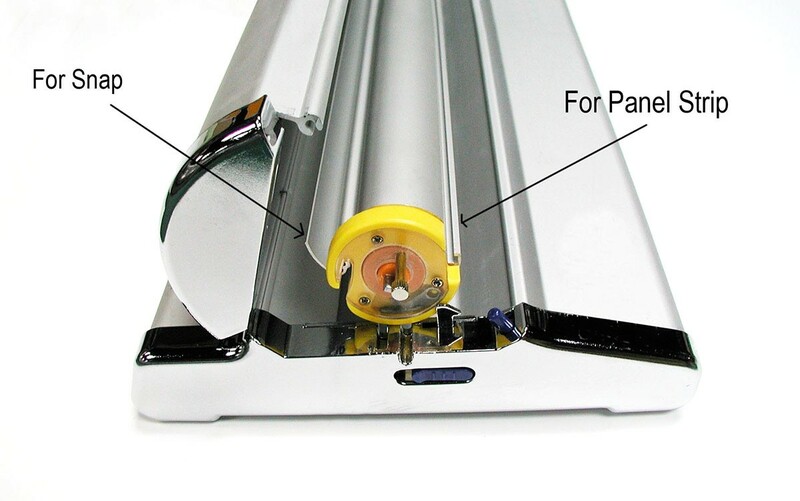 The roller has a snap lock rail so the banner can be attached directly to the roller, eliminating the need for a leader that is standard on most banner stands. It also means that any banner can be used without the need for adhesives, velcro or other special attachments. 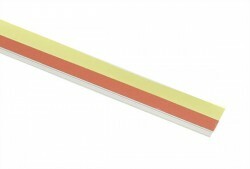 For even easier mounting, the included adhesive panel strip can be applied to the bottom of the banner. 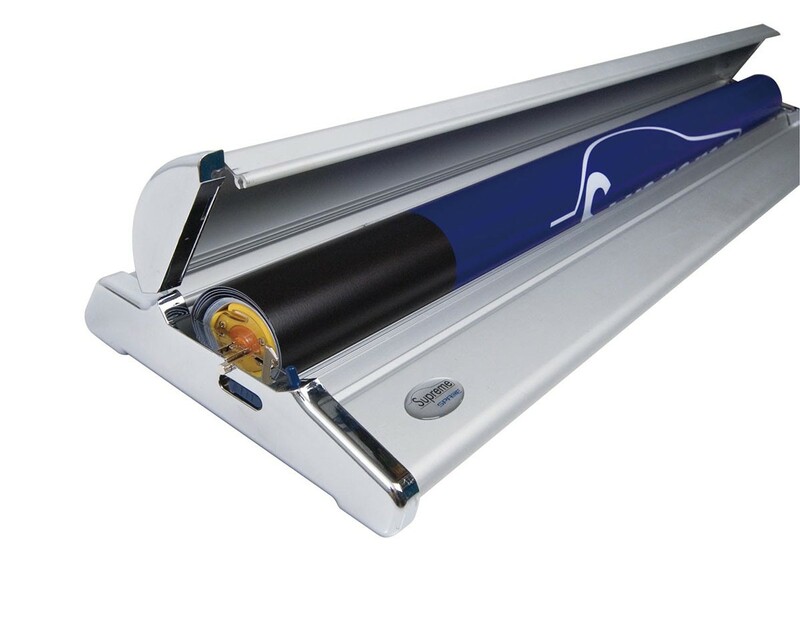 Simply slide the panel strip grooves into the matching channel on the roller and you've mounted the banner. This is a popular option, but isn't recommended for fabrics or any material that the adhesive panel strip might have trouble adhering to. The standard adjustable height pole can display a banner with a visible size from 35" to 84.7" tall, allowing the Supreme to be used for everything from a table top banner stand to a full height floor standing display. 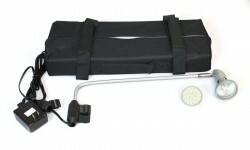 A three-part bungee connected pole with a fixed 84.7" height can be substituted for the adjustable pole when ordering. Fixed height poles have the greatest reliability over time, since they have no moving parts to wear out, so for customers who don't need the adjustable height, this is an option to consider. 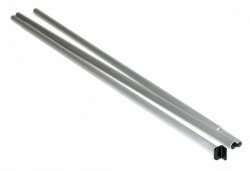 The telescopic pole works with lever locks for fast and easy adjustments of the pole height. These are much easier to use than the twist-to-lock style of telescopic poles that are common on lower end stands, and even some high end models. They are also more reliable over time, which is why high-end models tend to use this style of pole. 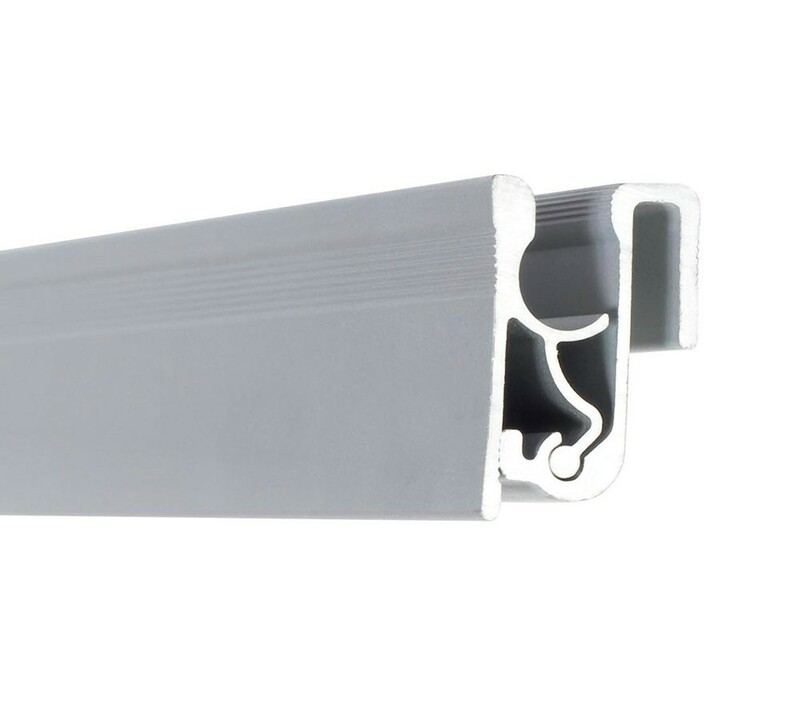 The Supreme has adjustable feet for maximum stability and use on uneven floors and comes in a satin silver finish with polished end caps. Since the full height 84.7" banner is the most popular, it's the only size we offer by default, but other heights can be ordered by selecting the stand without a banner, then choosing a banner from the from the Related items tab. The other banner sizes can also be found by going to the Replacement Banners section, or by using the search function to look up Supreme and scroll through the different products and accessories. The Supreme 33 retractable banner stand displays a graphic with a visual area of 33.4" wide x 35" to 84.7" high. Comes complete with a deluxe carrying bag. An upgrade for this model to a similar style would be the Expolinc Roll Up Classic. 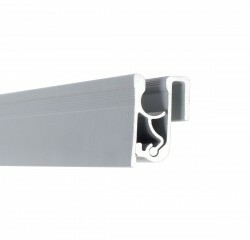 The Expolinc Roll Up Classic is very similar in looks and function to the Supreme, so it could be argued that it's not much of an upgrade, but it is a professional quality stand with a lifetime warranty that can be ordered with either an adjustable height pole, or with one of 4 different fixed height poles from 57" to 96.5" in height. 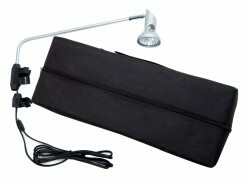 It also has some additional accessories available such as color accent kits and 75 watt spotlight that are not available with the Supreme. It does not have the snap rail mounting on the roller, and instead requires a panel strip. A less expensive model that is very similar would be the Sterling. The Sterling is a knock-off of the Supreme, so it has almost all the same features, but without the option for the fixed height pole. The build quality, while good, isn't as good as the Supreme, which is why we still offer both, for those who want the features of the Supreme, but at a lower cost. The Sterling also comes in black in addition to the silver finish. 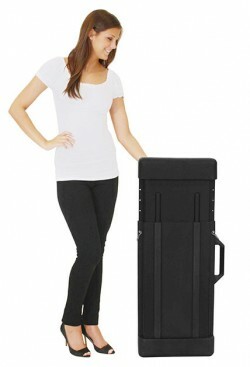 A hard shipping case is a great accessory for any retractable banner stand that gets shipped even a few times a year. 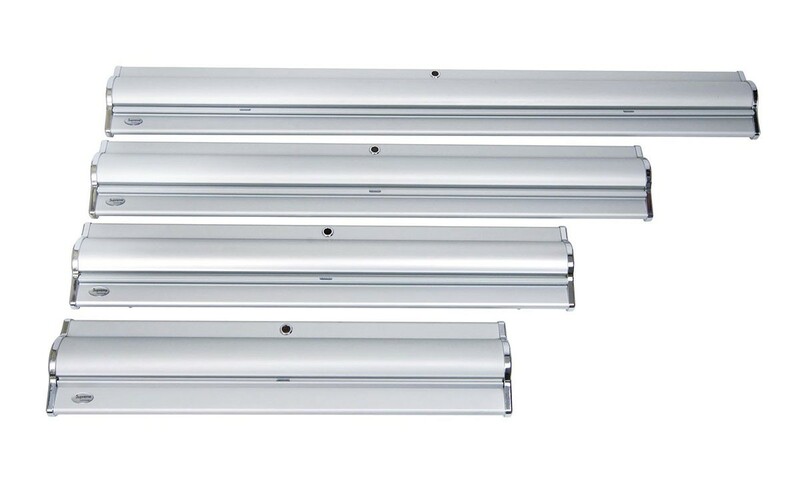 By helping to prevent damage in transit, it not only prolongs the life of your banner stands, but it also makes it less likely you will end up at a trade show or event with broken stands. 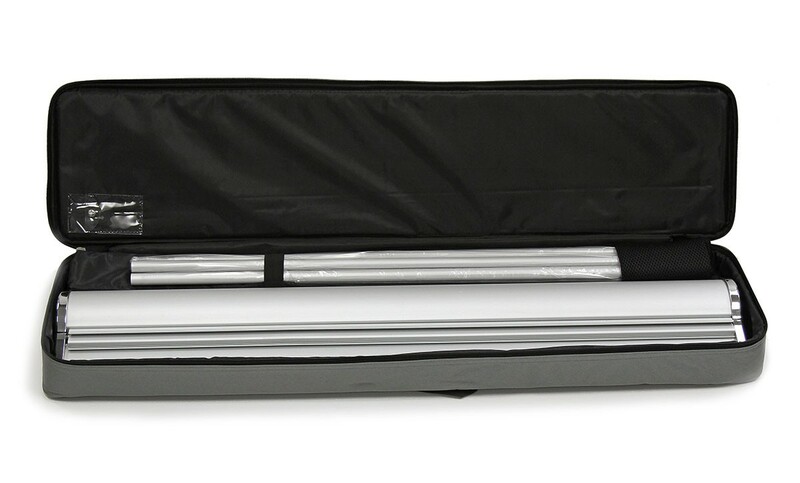 The Adjustable Banner Stand Case is the recommended model for the Supreme, and it will hold the stand inside its individual travel bag for extra protection. You can find these cases by scrolling through the items in the Related Products tab or in the Shipping Cases section of the main menu. Shipping size: 39" x 12" x 6"